Writing this blog has been quite a fun experience! Just when I was starting to really get into the swing of it, I got handed a surprise by my husband. “Honey, we’re moving to Budapest.” As in Hungary. In 6 weeks. What?? So if you’ve been wondering why this blog has gone silent for a while, it is because I have had to focus all my energy in getting our household ready to move across the ocean to a place I have never been before. We may not have human children, but getting two dogs and a cat is just as chaotic. In fact, I would argue more so. But the good news is that we have finally arrived. And that means a new blog! So please follow my adventures in food, culture and whatever else I come across at www.travelsandwich.com. My guess is, people get happy over here too! 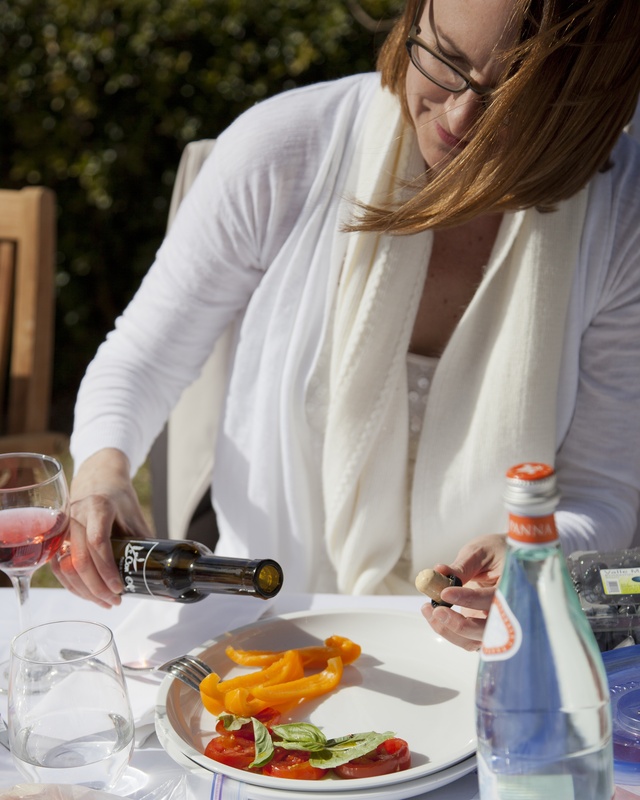 The new way to picnic – flash mob style! A few weeks ago my husband and I received this mysterious invitation in the mail, inviting us to “Le Dejeuner en Blanc”, or for those of us who don’t speak French, a “lunch in white” party. With the invitation came a very detailed explanation and set of instructions. 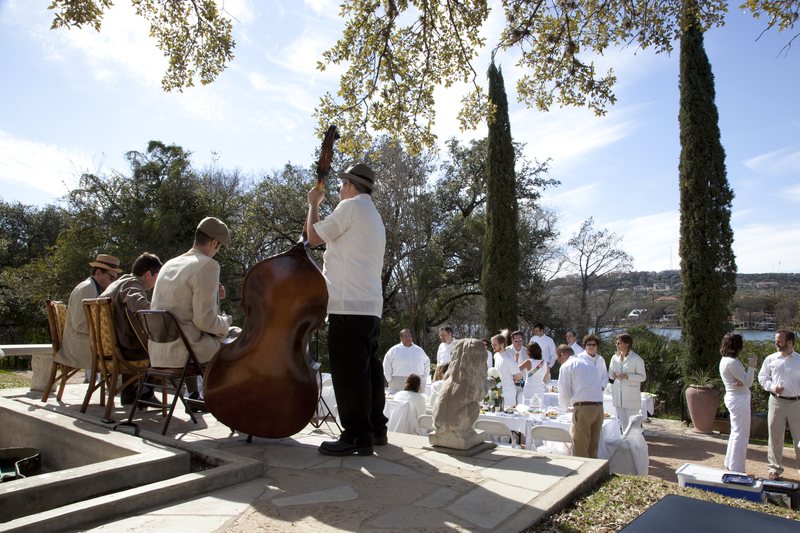 The event was described as an elegant, festive occasion in which the guests dress all in white and meet at a secret location to share a meal – a flash-mob picnic! All guests, after they RSVP, will be assigned a “table head” and this person will instruct them on where to meet with the others at their table on the day of the event. After everyone meets at this location, only then will they be told of where the actual picnic is going to take place. 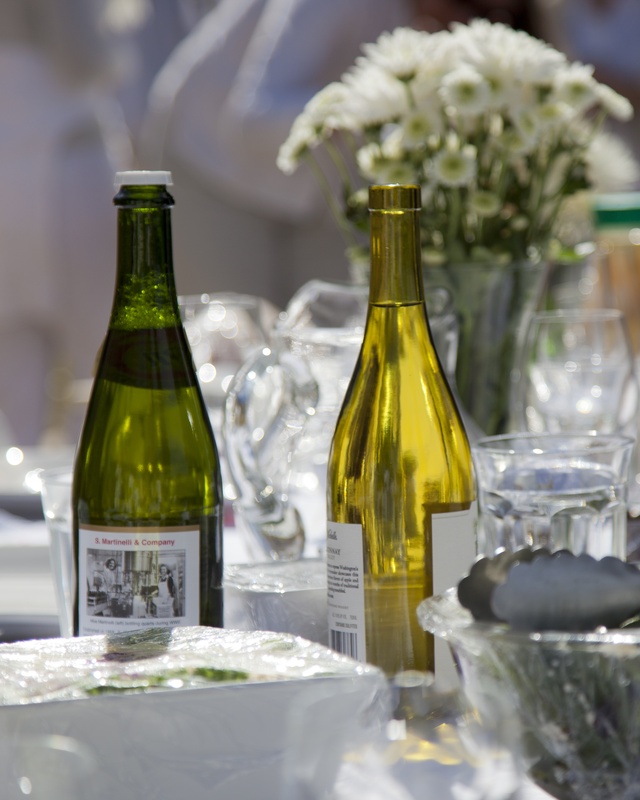 Every person is responsible for bringing the food/drinks for their picnic, as well as a table, chairs, plates (all in white), silverware, etc. Wow. This intrigued me from the start, unlike my husband – who thought it was one of two things: 1) a ploy to sell us a time share or 2) a complete lunatic who is interested in luring naive and willing participants into an abandoned warehouse to kill them so he can wear their skin (I think he’s watched The Silence of the Lambs movie a few too many times). Well, call me naive because I was all in. It sounded like quite a bit of work, but so what! There was a website link on the invitation to give you an idea of the event, so I immediately checked it out. Apparently this event started in Paris, France quite a few years ago and has spread to Montreal, New York, San Francisco and a few others. The photos from previous events looked fantastic. My first thought was, who put us on this list? It is quite a long story, but after questioning several of my friends – who LIED to me and said they had no idea what I was talking about (shame on you but I must say, you got me, you little devils) – it turned out to be one of my friends who put the whole event together – and she did a fantastic job. The secret location turned out to be at Laguna Gloria, on the back lawn by the river. And I could not have thought of a more perfect place. The sky was blue, the temperature was perfect and everyone looked absolutely radiant! 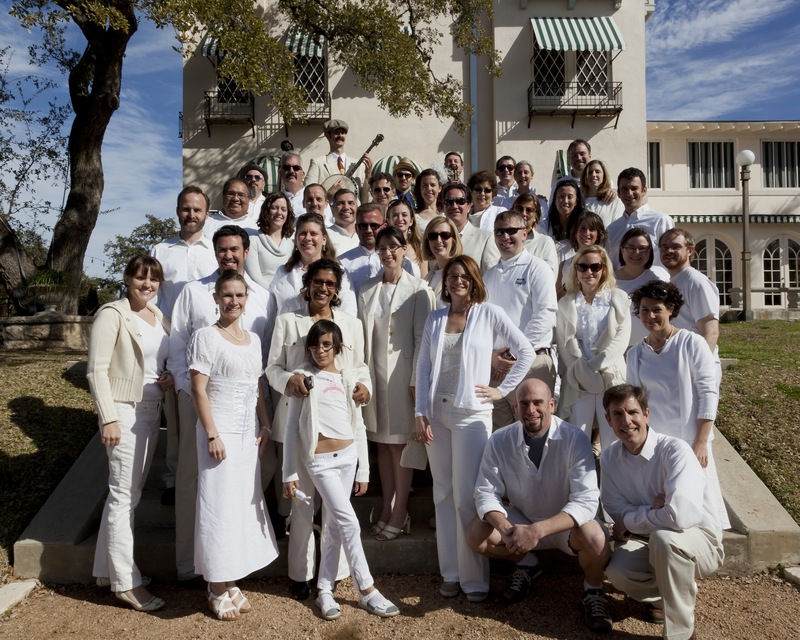 I was amazed really that everyone abided by the rule of wearing white, or at least mostly white. The tables were all adorned with white table cloths, most of the chairs were covered in white, white flowers on the tables – it was amazing. Soon the wine (white, of course) and conversations were flowing. There were many people there I didn’t know, so it was great to make new acquaintances. And to top it all off – a band suddenly appeared! The four piece ensemble, consisting of a few of the members of the very popular local band, White Ghost Shivers, provided a 1920s jazzy sound that really fit with the occasion. Did I mention that this day was also the party planner’s birthday? Yes, she turned 40! What a great way to celebrate – and what a stark contrast to my 40th birthday this past year, which consisted of drinking beer in the heat of the summer while propelling a bar on wheels – which was freakin’ AWESOME by the way, so I’m not knocking it! But this was definitely more her speed – elegant and refined, but with a spontaneity that was not the least bit stuffy. I could not have pictured a more perfect way to spend an afternoon. 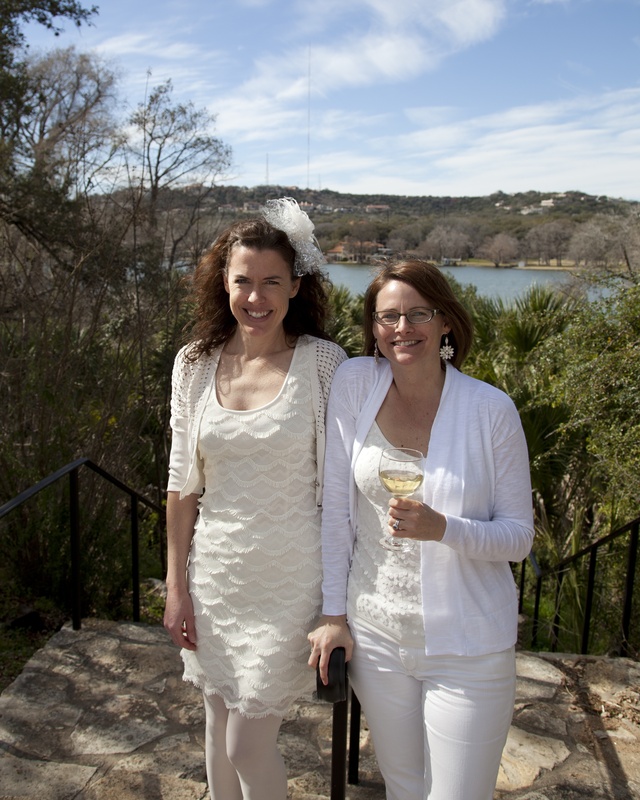 It had everything I love most – great weather, great food, great wine, great music – and most of all, great friends. How lucky I feel to be included in a circle of such wonderful people who are willing to pull out all the white clothes they own, pack up their dining room and travel to who-knows-where to meet who-knows-who. I’m not sure if you would call that impressive or crazy, but either way, I call it fabulous. Santé!